Church records are excellent sources, and sometimes the only sources, of names, dates, and places of births, marriages, and deaths. The records of some denominations, such as the Lutherans, are valuable for identifying the town or parish an immigrant came from. 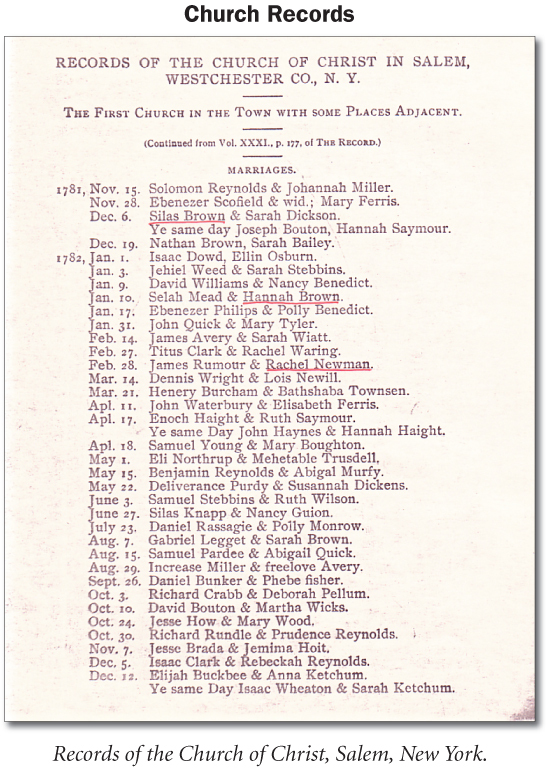 Church records usually include baptisms, marriages, burials, and minutes. However, the records and the information they provide vary greatly depending on the denomination and the record keeper. If you’ve traced your American ancestors to colonial times, you’ll probably find them in the records of Anglican, Baptist, Congregational, Dutch Reformed, Lutheran, Presbyterian, Quaker or Roman Catholic churches. If your families arrived in the 19th century, in addition to the religious groups mentioned above, you may find they belonged to Episcopal, Methodist, German Reformed, Unitarian or Universalist. Our ancestors frequently changed from one denomination to another—sometimes several times. They usually joined or attended the church nearest to them. Use land records to locate your ancestors’ place of residence; then study old maps to learn what churches were in the area. Many original church records are still at the local church. Others have been gathered into church or state archives, or deposited with a local historical society. To locate them, you must first identify your ancestor’s denomination. • Family History Library Check the FHL Catalog under [State], [County], [Town] – Church Records. • Write directly to the minister of the local church. Addresses are usually in city or telephone directories. • Write to the church headquarters to ask where the records of the specific congregation are located. • Write to the local historical society. • Check local histories to determine which churches were in the area the same time as your ancestors. • Write to a local library or historical society for information on churches in the area. • Check periodicals for published church records.